We have been awarded the Golden Fork Award in the Great Taste Awards for Best Speciality Food Midlands & East Anglia for our free range loin of pork. 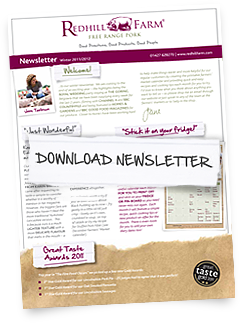 The Great Taste Awards is the world's largest and most rigorous food awards scheme involving over 400 judges and thousands of hours of blind tasting. "Lovely looking rack of pork. Golden skin and savoury aromas. The texture is very tender and it carves very well. The fat is nice and sweet and the crackling came up very well. Full ﬂavoured pork as it should be." The judges also awarded it a 3 star Gold and selected it as one of the Top 50 Foods in Britain before nominating it for a prestigious Golden Fork Award.